But that's not really what I want to talk about. After seeing the doctor and talking with him about the nasty sore Mark has on his right heel, and what it might mean if we can't get it to heal, that this is another thing, something changed for me. That he and I are on two SEPARATE paths. Two different journeys. I don't mean that we aren't on the same page or close anymore. It's not that we're not connecting. It has nothing to do with our relationship. It has to do with what he experiences as the one who is sick versus what I experience as the spouse of a sick person. 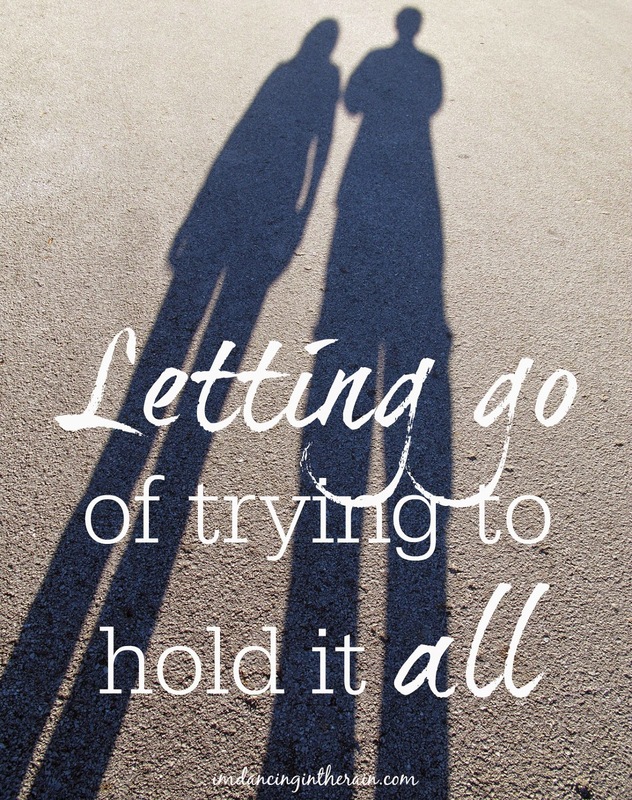 And letting go of trying to hold it ALL. These things are happening to him, not me. I'm not the one with the chronic illnesses. It's like I thought if I love him as much as I say I do I would be weighed down by his stuff AND my stuff. But the thing is, that doesn't serve to help me be there for him. Especially if I'm too overwhelmed by feeling all the things. I suppose this sounds like putting up a wall in the name of self-preservation. Truly though, that's not what I'm saying. Or doing. I'm not distancing myself from my husband. On the contrary. Since having this light bulb moment, I feel stronger, more patient, more compassionate and more capable of being there for him. The stress of Mark's hospital stay in September was tempered by this new space I'm in. Mark was emotional and not thinking very clearly, and I was able to do that for him, to be what he really needed when he needed it. Being both a caregiver and wife who just loves her husband and hates what he's going through is difficult to balance. But I think, with each new challenge, I learn a little more how to be better at both.